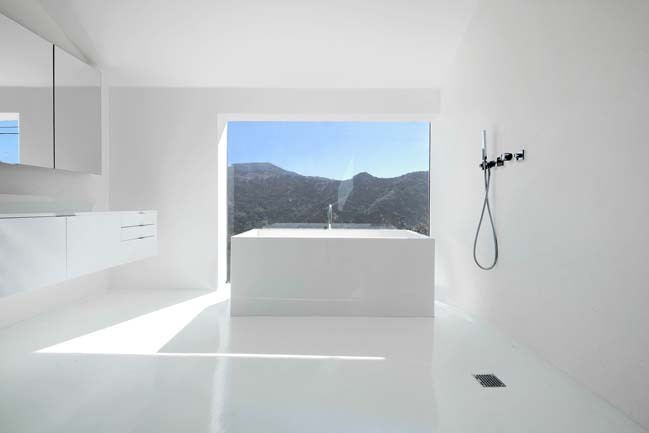 Nakahouse is modern hillside house located on a West facing ridge in the Hollywood Hills, California. The house designed by XTEN Architecture. 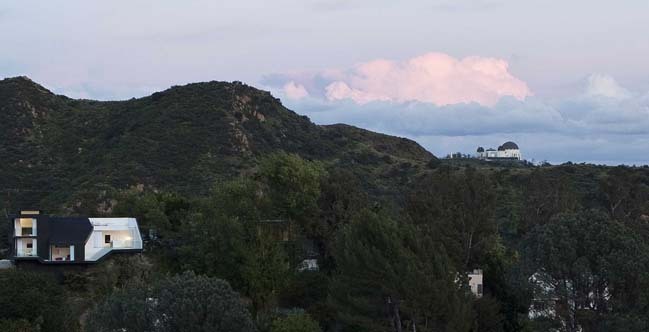 To the South and West are canyon views, to the East is a protected natural ravine, with a view of Griffith Park Observatory in the distance. From the architects: The existing home was built as a series of terraced volumes on the downslope property. There was little relationship to the site, the interiors were closed to the views and were cut off from one another. Due to geotechnical, zoning, budget and ecological considerations the foundations and building footprint were maintained in the current design. The interior was completely reconfigured however, and the exterior was opened up to the hillside views and the natural beauty of the surroundings. 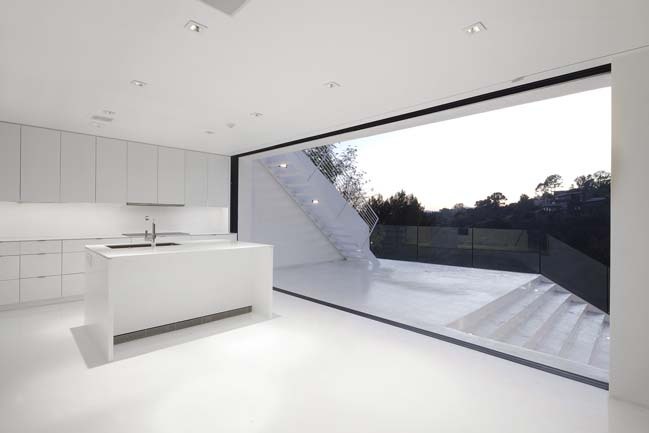 A series of abstract indoor-outdoor spaces with framed views to nature are rendered in white lacquered cabinetry, white concrete epoxy floors, white plaster and white steel. One room pours into another, eliminating clear division or division between spaces, and providing the illusion of weightlessness. The series of interconnected terraced spaces connect the rooms to each other and to the outdoors, lending further to the concept of an 'uncontained' space, with no rigid beginnings or ends. Air moves freely through a circuit created by the new design - the home doesn't need or have air conditioning. Environmentally, the house is designed to be passively cooled, with sliding glass panels that open in the North, East and West directions and take advantage of prevailing hillside breezes. Operable clerestory windows at the second floor create a thermal chimney to extract warm air from the residence, and a high performance Sarnofil roofing system minimizes heat gain from the roof.